1708 Gallery is currently accepting proposals for 2016 and 2017. The Bottom Needs A Shadow by 2014 exhibiting artist Thomas Burkett, Alexander Hayden, and Aaron Koehn. National and international artists and curators are encouraged to submit proposals to exhibit work in all mediums (including but not limited to: video and film, new media, installation, sculpture, performance, painting and social practice). While proposals may include work made in the last three years, 1708 Gallery strongly encourages proposals for new, site-specific, or developing projects and bodies of work. The deadline for submissions is 11:59 PM EST on Sunday, March 1, 2015. 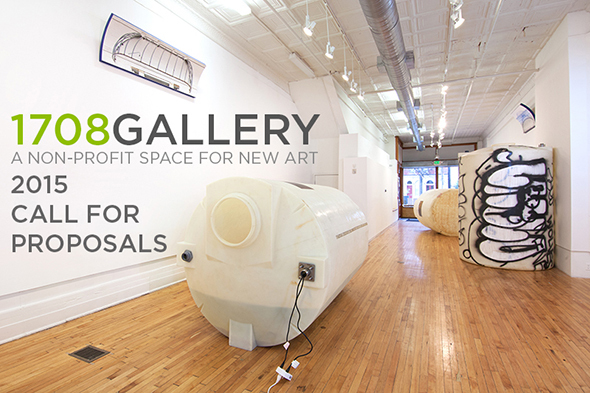 Selected proposals will be given an exhibition of approximately six weeks at 1708 Gallery and will receive a $1000 honorarium, in addition to other installation and exhibition support. Students must have an anticipated graduation date of May 2016 (or sooner) to be eligible for an exhibition.